1 A None No Power Seat 1 A is a standard Business Class seat located at a bulkhead. The proximity to the galley and lavatory area might be bothersome. 1 D None No Power Seat 1 D is a standard rear facing Business Class seat. On International flights, this seat is blocked from booking and is used as a pilot crew rest seat. 1 H None No Power Seat 1 H is a standard rear facing Business Class seat. 1 L None No Power Seat 1 L is a standard Business Class seat located at a bulkhead. The proximity to the galley and lavatory area might be bothersome. 10 A None No Power Seat 10 A is a standard Economy Class seat in the Main Cabin Extra section. The seat features additional legroom and may be selected for an additional fee. 10 B None No Power Seat 10 B is a standard Economy Class seat in the Main Cabin Extra section. The seat features additional legroom and may be selected for an additional fee. 10 C None No Power Seat 10 C is a standard Economy Class seat in the Main Cabin Extra section. The seat features additional legroom and may be selected for an additional fee. 10 D None No Power Seat 10 D is a standard Economy Class seat in the Main Cabin Extra section. The seat features additional legroom and may be selected for an additional fee. 10 E None No Power Seat 10 E is a standard Economy Class seat in the Main Cabin Extra section. The seat features additional legroom and may be selected for an additional fee. 10 H None No Power Seat 10 H is a standard Economy Class seat in the Main Cabin Extra section. The seat features additional legroom and may be selected for an additional fee. 10 J None No Power Seat 10 J is a standard Economy Class seat in the Main Cabin Extra section. The seat features additional legroom and may be selected for an additional fee. 10 K None No Power Seat 10 K is a standard Economy Class seat in the Main Cabin Extra section. The seat features additional legroom and may be selected for an additional fee. 10 L None No Power Seat 10 L is a standard Economy Class seat in the Main Cabin Extra section. The seat features additional legroom and may be selected for an additional fee. 11 A None No Power Seat 11 A is a standard Economy Class seat in the Main Cabin Extra section. The seat features additional legroom and may be selected for an additional fee. 11 B None No Power Seat 11 B is a standard Economy Class seat in the Main Cabin Extra section. The seat features additional legroom and may be selected for an additional fee. 11 C None No Power Seat 11 C is a standard Economy Class seat in the Main Cabin Extra section. The seat features additional legroom and may be selected for an additional fee. 11 D None No Power Seat 11 D is a standard Economy Class seat in the Main Cabin Extra section. The seat features additional legroom and may be selected for an additional fee. 11 E None No Power Seat 11 E is a standard Economy Class seat in the Main Cabin Extra section. The seat features additional legroom and may be selected for an additional fee. 11 H None No Power Seat 11 H is a standard Economy Class seat in the Main Cabin Extra section. The seat features additional legroom and may be selected for an additional fee. 11 J None No Power Seat 11 J is a standard Economy Class seat in the Main Cabin Extra section. The seat features additional legroom and may be selected for an additional fee. 11 K None No Power Seat 11 K is a standard Economy Class seat in the Main Cabin Extra section. The seat features additional legroom and may be selected for an additional fee. 11 L None No Power Seat 11 L is a standard Economy Class seat in the Main Cabin Extra section. The seat features additional legroom and may be selected for an additional fee. 12 A None No Power Seat 12 A is a standard Economy Class seat in the Main Cabin Extra section. The seat features additional legroom and may be selected for an additional fee. 12 B None No Power Seat 12 B is a standard Economy Class seat in the Main Cabin Extra section. The seat features additional legroom and may be selected for an additional fee. 12 C None No Power Seat 12 C is a standard Economy Class seat in the Main Cabin Extra section. The seat features additional legroom and may be selected for an additional fee. 12 J None No Power Seat 12 J is a standard Economy Class seat in the Main Cabin Extra section. The seat features additional legroom and may be selected for an additional fee. 12 K None No Power Seat 12 K is a standard Economy Class seat in the Main Cabin Extra section. The seat features additional legroom and may be selected for an additional fee. 12 L None No Power Seat 12 L is a standard Economy Class seat in the Main Cabin Extra section. The seat features additional legroom and may be selected for an additional fee. 17 C None No Power Seat 17 C is a standard Economy Class seat. The seat back might be bumped by crew and passenger passing from behind due position of the seat with the aisle. The proximity to the lavatory area might be bothersome. 17 J None No Power Seat 17 J is a standard Economy Class seat. The seat back might be bumped by crew and passenger passing from behind due position of the seat with the aisle. The proximity to the lavatory area might be bothersome. 18 A None No Power Seat 18 A is a standard Economy Class seat, however, the proximity to the lavatories and galley may be bothersome. 18 B None No Power Seat 18 B is a standard Economy Class seat, however, the proximity to the lavatories and galley may be bothersome. 18 D None No Power Seat 18 D is a standard Economy Class seat, however, the proximity to the lavatories and galley may be bothersome. 18 E None No Power Seat 18 E is a standard Economy Class seat, however, the proximity to the lavatories and galley may be bothersome. 18 H None No Power Seat 18 H is a standard Economy Class seat, however, the proximity to the lavatories and galley may be bothersome. 18 K None No Power Seat 18 K is a standard Economy Class seat, however, the proximity to the lavatories and galley may be bothersome. 18 L None No Power Seat 18 L is a standard Economy Class seat, however, the proximity to the lavatories and galley may be bothersome. 19 A None No Power Seat 19 A is a standard Main Cabin Extra seat that is missing a window. The protrusion of the exit door may be bothersome. The proximity to the lavatories and galley may be bothersome. There is no under seat storage space available at this seat. 19 B None No Power Seat 19 B is a standard Main Cabin Extra seat that has extra legroom due to the exit however, the proximity to the lavatories and galley may be bothersome. There is no underseat storage space available at this seat. 19 C None No Power Seat 19 C is a standard Main Cabin Extra seat that has extra legroom due to the exit however, the proximity to the lavatories and galley may be bothersome. There is no underseat storage space available at this seat. 19 J None No Power Seat 19 J is a standard Main Cabin Extra seat that has extra legroom due to the exit however, the proximity to the lavatories and galley may be bothersome. There is no underseat storage space available at this seat. 19 K None No Power Seat 19 K is a standard Main Cabin Extra seat that has extra legroom due to the exit however, the proximity to the lavatories and galley may be bothersome. There is no underseat storage space available at this seat. 19 L None No Power Seat 19 L is a standard Main Cabin Extra seat that is missing a window. The protrusion of the exit door may be bothersome. The proximity to the lavatories and galley may be bothersome. There is no under seat storage space available at this seat. 2 A None No Power Seat 2 A is a standard rear facing Business Class seat. 2 L None No Power Seat 2 L is a standard rear facing Business Class seat. 20 D None No Power Seat 20 D is a standard Main Cabin Extra seat that has extra legroom due to the position of the bulkhead however, the proximity to the lavatories and galley may be bothersome. 20 E None No Power Seat 20 E is a standard Main Cabin Extra seat that has extra legroom due to the position of the bulkhead however, the proximity to the lavatories and galley may be bothersome. 20 H None No Power Seat 20 H is a standard Main Cabin Extra seat that has extra legroom due to the position of the bulkhead however, the proximity to the lavatories and galley may be bothersome. 26 A None No Power Seat 26 A is a standard Economy Class seat that has a misaligned window. 26 L None No Power Seat 26 L is a standard Economy Class seat that has a misaligned window. 27 A None No Power Seat 27 A is a standard Economy Class seat that has a misaligned window. 27 L None No Power Seat 27 L is a standard Economy Class seat that has a misaligned window. 3 D None No Power Seat 3 D is a standard rear facing Business Class seat. 3 H None No Power Seat 3 H is a standard rear facing Business Class seat. 30 A None No Power Seat 30 A is a standard Economy Class seat in the last row of the aircraft that may have limited recline. The proximity to the galleys may be bothersome. 30 C None No Power Seat 30 C is a standard Economy Class seat in the last row of the aircraft that may have limited recline. The proximity to the galleys may be bothersome. 30 D None No Power Seat 30 D is a standard Economy Class seat in the last row of the aircraft that may have limited recline. The proximity to the galleys may be bothersome. 30 E None No Power Seat 30 E is a standard Economy Class seat in the last row of the aircraft that may have limited recline. The proximity to the galleys may be bothersome. 30 H None No Power Seat 30 H is a standard Economy Class seat in the last row of the aircraft that may have limited recline. The proximity to the galleys may be bothersome. 30 J None No Power Seat 30 J is a standard Economy Class seat in the last row of the aircraft that may have limited recline. The proximity to the galleys may be bothersome. 30 L None No Power Seat 30 L is a standard Economy Class seat in the last row of the aircraft that may have limited recline. The proximity to the galleys may be bothersome. 4 A None No Power Seat 4 A is a standard rear facing Business Class seat. 4 L None No Power Seat 4 L is a standard rear facing Business Class seat. 5 A None No Power Seat 5 A is a standard Business Class seat. The proximity to the galley and lavatory area might be bothersome. This seat only has one window, while other Business Class seats have two. 5 D None No Power Seat 5 D is a standard rear facing Business Class seat however, the proximity to the lavatories and galley may be bothersome. 5 H None No Power Seat 5 H is a standard rear facing Business Class seat however, the proximity to the lavatories and galley may be bothersome. 5 L None No Power Seat 5 L is a standard Business Class seat. The proximity to the galley and lavatory area might be bothersome. This seat only has one window, while other Business Class seats have two. 6 A None No Power Seat 6 A is a standard rear facing Business Class seat however, the proximity to the lavatories and galley may be bothersome. 6 L None No Power Seat 6 L is a standard rear facing Business Class seat however, the proximity to the lavatories and galley may be bothersome. 7 D None No Power Seat 7 D is a standard rear facing Business Class seat. 7 H None No Power Seat 7 H is a standard rear facing Business Class seat. 8 A None No Power Seat 8 A is a standard Economy Class seat located at a bulkhead and in the Main Cabin Extra section. The seat features additional legroom and may be selected for an additional fee. The tray table and inflight entertainment monitor are installed in a fixed armrest, therefore, slightly reducing seat width. Floor storage for personal items is not available for use during takeoff and landing. 8 B None No Power Seat 8 B is a standard Economy Class seat located at a bulkhead and in the Main Cabin Extra section. The seat features additional legroom and may be selected for an additional fee. The tray table and inflight entertainment monitor are installed in a fixed armrest, therefore, slightly reducing seat width. Floor storage for personal items is not available for use during takeoff and landing. 8 C None No Power Seat 8 C is a standard Economy Class seat located at a bulkhead and in the Main Cabin Extra section. The seat features additional legroom and may be selected for an additional fee. The tray table and inflight entertainment monitor are installed in a fixed armrest, therefore, slightly reducing seat width. Floor storage for personal items is not available for use during takeoff and landing. 8 D None No Power Seat 8 D is a standard Economy Class seat located at a bulkhead and in the Main Cabin Extra section. The seat features additional legroom and may be selected for an additional fee. The tray table and inflight entertainment monitor are installed in a fixed armrest, therefore, slightly reducing seat width. Floor storage for personal items is not available for use during takeoff and landing. 8 E None No Power Seat 8 E is a standard Economy Class seat located at a bulkhead and in the Main Cabin Extra section. The seat features additional legroom and may be selected for an additional fee. The tray table and inflight entertainment monitor are installed in a fixed armrest, therefore, slightly reducing seat width. Floor storage for personal items is not available for use during takeoff and landing. 8 H None No Power Seat 8 H is a standard Economy Class seat located at a bulkhead and in the Main Cabin Extra section. The seat features additional legroom and may be selected for an additional fee. The tray table and inflight entertainment monitor are installed in a fixed armrest, therefore, slightly reducing seat width. Floor storage for personal items is not available for use during takeoff and landing. 8 J None No Power Seat 8 J is a standard Economy Class seat located at a bulkhead and in the Main Cabin Extra section. The seat features additional legroom and may be selected for an additional fee. The tray table and inflight entertainment monitor are installed in a fixed armrest, therefore, slightly reducing seat width. Floor storage for personal items is not available for use during takeoff and landing. 8 K None No Power Seat 8 K is a standard Economy Class seat located at a bulkhead and in the Main Cabin Extra section. The seat features additional legroom and may be selected for an additional fee. The tray table and inflight entertainment monitor are installed in a fixed armrest, therefore, slightly reducing seat width. Floor storage for personal items is not available for use during takeoff and landing. 8 L None No Power Seat 8 L is a standard Economy Class seat located at a bulkhead and in the Main Cabin Extra section. The seat features additional legroom and may be selected for an additional fee. The tray table and inflight entertainment monitor are installed in a fixed armrest, therefore, slightly reducing seat width. Floor storage for personal items is not available for use during takeoff and landing. 9 A None No Power Seat 9 A is a standard Economy Class seat in the Main Cabin Extra section. The seat features additional legroom and may be selected for an additional fee. 9 B None No Power Seat 9 B is a standard Economy Class seat in the Main Cabin Extra section. The seat features additional legroom and may be selected for an additional fee. 9 C None No Power Seat 9 C is a standard Economy Class seat in the Main Cabin Extra section. The seat features additional legroom and may be selected for an additional fee. 9 D None No Power Seat 9 D is a standard Economy Class seat in the Main Cabin Extra section. The seat features additional legroom and may be selected for an additional fee. 9 E None No Power Seat 9 E is a standard Economy Class seat in the Main Cabin Extra section. The seat features additional legroom and may be selected for an additional fee. 9 H None No Power Seat 9 H is a standard Economy Class seat in the Main Cabin Extra section. The seat features additional legroom and may be selected for an additional fee. 9 J None No Power Seat 9 J is a standard Economy Class seat in the Main Cabin Extra section. The seat features additional legroom and may be selected for an additional fee. 9 K None No Power Seat 9 K is a standard Economy Class seat in the Main Cabin Extra section. The seat features additional legroom and may be selected for an additional fee. 9 L None No Power Seat 9 L is a standard Economy Class seat in the Main Cabin Extra section. The seat features additional legroom and may be selected for an additional fee. Personal 110v power ports are offered at all seats throughout all classes. This Boeing 787-8 is the newest addition to American Airlines' fleet. This three-class aircraft seats a total of 226 passengers, and features up-to-date amenities, including personal Audio Video On Demand (AVOD) and personal 110v power ports at every seat. Some of the comments indicate the overhead bin for this seat is not available due to stored gear. That is not accurate this seat has a full bin. The seat is comfortable and quiet. The only negative is that the foot area is slightly narrow. My husband is 6' 6" and most of his height is in the legs. After reading a review of someone over 6' tall was totally comforatable in 29L I booked these seats. It was the worst flight we had ever taken. My husband sat in 29L for about 30 mins max and his knees were jammed into the seat in front of him. The right arm rest on the seat did not go up so he could not swing his legs around for more room. We switched seats so he could have the isles seat, which was a bit better for him. But we didn't think he was going to make the 8 hour flight. If you are over 6' tall I would not suggest these seats. Business class: really narrow aisles, biggest bathroom is starboard side before row 6, inconsistent enforcement of the stowage of TV (which is bad when you want to start a movie immediately), you feel all the motions of the seat connected to yours, seat 3A has two windows but only one is really usable, great having air vents you can control (2 of them), good service in business class. 5A and 5L should be half yellow and half green. Yes, theyre missing a window but i find that to be an advantage if youre trying to rest. The seat feels very cozy like youre in your own little suite! The rear facing Business class seats on the windows have ZERO privacy. These are Bad Seats. Flew from DFW-SCL overnight flight and found the seat really good. I liked the backwards arrangment. However, I prefer american's flagship 777 that they fly to hong kong because the seats are wider and they have better snacks and just a much bigger seat. The seat partition wall was fixed in the up position and we were unable to move it down making it difficult to converse with one another. Fine if traveling alone, but couples traveling together have no decent seating configuration to enjoy the flight together. This is the latest offering from Boeing and the air quality does improve your flight and make flying less tiring. Nice new planes but when you see how passengers treat them with their bags and other carry, I wonder how long they will look new. The bathroom look like a disaster area after flight as virtually every panel had been praised open in search of some hidden treasure. Also prefer soft close seats on 777. The things that AA need to improve? 1) Business seats wobble if someone behind or in front (attached in pairs) moves or God forbid gets up or sys down. 2) Light weight seats and seatback mounted touch screens in Coach mean you can have your seat back endlessly bumped by someone gaming behind. This is uncomfortable and prevents sleep. 3) The seats are narrower or feel narrower than 777 in both classes. The aisles are definitely narrower and in Business and Coach you are endlessly bumped by Flight attendants and other passengers. 4) The dimmable windows are nice but AA give control to the flight attendants. They seem surprised when you want the window open on a day time flight. Having flight attendants control the shades is not done by all carriers and a big mistake. Overall a big improvement on the 767's but I still prefer the 77W's. The protrusion of the exit door was literally cutting into the width of the seat at the hips and shoulders. There was no extra space between the seat and the wall like the standard couple of inches on other aircraft. Definitely no window unless you leaned back and looked over your shoulder. Really liked this plane. Great entertainment options. Seat did feel narrower than on other planes. But, main cabin extra does provide more leg room, which is more important to me. The food was pretty bad and I think I would prefer AA offered food for sale on international flights. The worst thing about the flight was the dimming of the lights by the FA throughout most of the flight, in spite of several requests to be able to allowed to look out (it was a day flight after all). We even flew over Greenland and on a clear day (which it was) - you normally have wonderful views. Eventually, the windows were undimmed in Business Class. But, in coach, we had to wait till about 1hr before landing. Really frustrating. AA should definitely change this customer unfriendly policy! My daughter and I went from ORD to LHR on the herringbone pattern and we had no problems. My seat was by the window and her's was rear facing. It was actually better than having the two seats together in the center section. With this arrangement you are looking at the person facing the reverse direction. If we sat next to each other we would have to learn forward to see each other. This section was very quiet and great for sleeping. On our return flight out of FCO to ORD. We did the same with one at the window and one in the center section, but in row 4. Note - on these particular planes there are no window shades to put up or down. The plane controls the lighting. We wanted it bright so we could stay awake and my daughter who was at the window kept trying to adjust it for more light. Wish that passengers had more control over this. I noticed the back section of BC was completely dark, which I would not have liked. On any return flight from Europe I want to stay awake and just nap since it is during the day. This seems to help avoid jet lag for me. Very comfortable economy seat with extra legroom. I flew 7A from ORD to PEK on Aug 6. One advantage to 7A - the seat is not connected to 6A, so as other passengers have said, you never feel your neighbor shift in flight. Another bonus to this seat is the very large storage bin adjacent your seat. Food was decent and FA service was good. Now for the complaints: The lie-flat seats do not in fact lie flat, as I slid into the ottoman the entire flight while I slept, mashing my toes. The flat seat area is also very narrow, so my knees consistently touched either vertical side of the seating area while trying to sleep on my side. (I am 6'2" and am generally comfortable in most business seats). This plane is equipped with electrically dimming windows, which do NOT in fact go dark. I usually avoid wearing the eye mask and get a great night's sleep - not on this plane. The IFE controls did not work consistently, so I ended up just using the screen itself, and it was therefore hard to control the volume level. AA FAs seem to need to collect the headsets 1 hour prior to landing, despite the IFE being active all the way until the plane touches down - annoying. Thought it would be great having all the extra legroom, but the nearness to the galley and the loos made it very loud. I thought there'd be small pockets on the bulkhead so we could store an item or 2, but the bulkhead is about 4 feet away with a jumpseat for the flight attendant. Did not get a wink of sleep on this flight due to getting knocked about by people walking by the aisle seat, as well as people gathering in the galleys to talk. Seat 1A has 1 window not 2 but it does not feel any more closed in. Being the first row and facing the window it is very private and gets good service from the flight attendants. The 787 does feel slightly more cramped than the 777-300. it was perfect for ORD-LHR flight but an 11 hour + might feel a little claustrophobic. The seat feels slightly narrower than the 777-300 Business seat but still long enough for me to nap for 3 hours at 6'5" (which is more than any BA Business Seat permits). The catering has improved on AA and the Flagship Lounges are a big improvement. The seat only has a single multi adjust option with several key positions, so you cannot alter footrest, backrest and seat forward backwards as you can on some other designs. However I found it easy to get comfortable. As others have observed, the elephant in the room is the wobbly seats which transmit the movements of the passenger behind. On my flight the passenger behind seemed to be breakdancing for the first few minutes but settled down. It was slightly irritating rather than annoying and after the first 30 minutes was no real issue. I experienced no problem with noise or light from the galley, using the eye mask and the ear plugs. Overall a vast improvement on the 767 300 which used to fly this service but I would still opt for a 777 300 service on AA if there was an option. 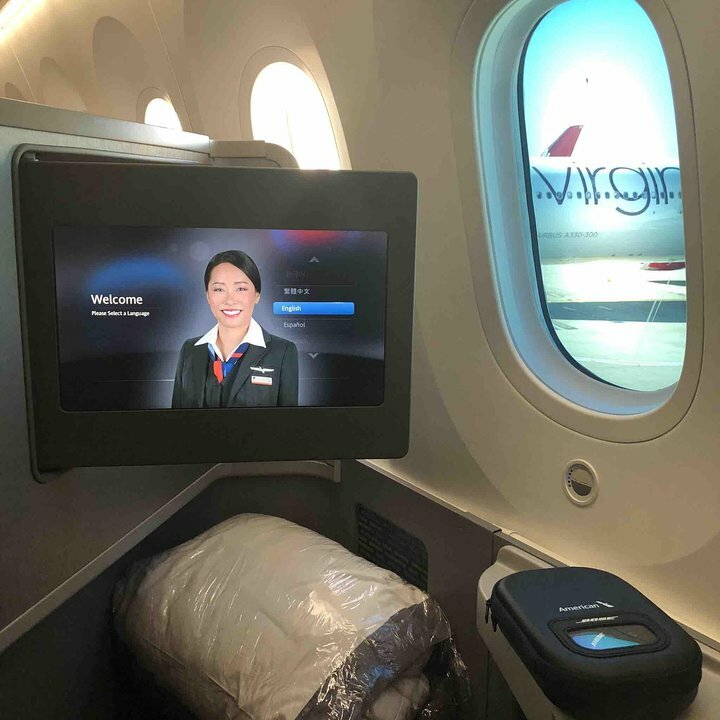 The 787 800 Business Seat and experience is now clearly well ahead of any British Airways offering in Business TATL. We were 30 minutes early landing and from door open to meeting my driver was 25 minutes with 2 bags, so overall Good Job AA. ORD-LHR. 26L has the misaligned window. I didn't find it to be a problem, there was good window coverage. 27L would be less desirable. I disagree with the 2 sentences on your review. The seat on my aircraft reclined as much as the other seats in front of me. There was about 18 inches of free space to the right of my seat/next to the bulkhead where I placed my carry-on after take-off. This freed the leg room under the seat in front of me. Made for easier access to ear phones, book, etc. especially while I had the tray table down. There was minimal galley noise/sounds. Great seat!!! I thought I was going to hate it after first checking SeatGuru.com. The only down-side to this seat is that a passenger may be last off the aircraft upon arrival at the gate. I love flying with AA. I was looking forward to the trip from Chicago to London. Paid extra for this. The seat was the worst seat I have ever experienced-and this is a new plane. The seat was uncomfortable, narrow and hard. I will go out of my way to avoid this again-American do something - arrived in London with back and knee ache! I was not the only one-nearly mentioned this to the staff but as you know arrived and want to get off. Seat overall was good but the plane is not aging well. Seat also rocked back and forth when the guy behind me moved in his seat. This was a day flight so the noise in the galley didn't bother me as I was awake anyhow. This plane looked like it was from the 80's as worn out as it looked and even had duct tape holding parts of the interior together. The plane body tapers back at this point and the seat is several inches narrower than the rest of the seats in economy. ODD numbered rows in Main Cabin Extra -- Window is slightly forward meaning shoulder room is less in these rows. Even numbered rows in MCE have the window a bit more aligned with shoulder position allowing a bit extra room. I was in row 11, and shoulder room was cramped with two other men in the row; I moved to an open aisle seat after takeoff. Probably the best seat on AA 787-8 as long as crew remembers to pay attention to the mini cabin. Proximity to Lav and Galley was a non issue and no issues of noise from Economy. Seat is disconnected at the head so no "motion over the ocean" issues like rows 1-4 which by itself could make it the best seat. Seat has extra storage compartment on top of wall for easy access to briefcase, pillow etc. 7A and 7L should be designated GOOD SEATS. You don't get any galley noise or lavatory noise. Light noise from economy is not an issue.It's the quietest part of the plane. I've flown both of these seats a few times between the US and PEK and PVG. This is where you want to be on the 788. This row has the best two seats. There is space on the right of the window seat 29L. So you can store items not only under the seat in front of you but also under the seat in front of the empty space to your right. extra storage space, and get a bit more legroom that way. 28L may also be a good option because you can lean the seat all the way back without worrying about impinging on anyone's leg room. I was worried whether the entire row in 30 would be able to recline because they lean against the wall. I did ask a passenger but she said she could recline just fine. An aisle seat is always more comfortable and don't have to worry about bothering people if you often use the restroom. I favor aisle seats vs. window seats on international flights,because excepting the first and last 1 hour, they automatically control and dim the windows for the duration of the flight whether or not you want to look out the windows so that other people can "sleep." As a side note, the two window seats behind this one (29 and 30) has extra empty space to the left. This seat is a standard rear facing lie-flat business class seat. Nothing special about it; I recommend the rear-facing seats over the forward-facing as the power outlets and storage compartment is easier to reach without turning around in the seat. There is no space (in any of the business class seats) to store your personal item during takeoff and landing, and the only storage space for personal items in the seat is no larger than an average-size purse or small drawstring bag. Be aware that if you bring a larger backpack or briefcase on as your personal item, it will probably have to stay in the overhead compartment the whole flight unless you want it sitting on the floor where your legs go. Standard international lie-flat business class seat. The only complaint I have about these seats is that there's nowhere to store your personal item (backpack, purse, etc.) during take-off and landing other than the overhead bins, and if you have anything more than a small purse or maybe a drawstring bag, there is really nowhere to put it anywhere in the seat (the storage space under the ottoman is rather small). 6A is a rear facing business class seat - generally the warning about proximity yo the galley and lavatories is correct - lot of traffic, noise and generally a poor seat choice. The only upside is this seat is not connected to another so you don't get the shaking or vibrations when the other seat occupant moves (as is the case with most seats in this aircraft configuration). AA seem to be planning to replace this seat design with an all forward facing herring bone design and that can't come soon enough - this seat is quite unstable when paired with another and I always seem to get Mr. Fidget seated in the adjoining seat. Finally the continuous banging of carts/trays whatever by the FA from this galley was really annoying - AA FA's just don't care how much noise they make - compared to a recent Cathay flight the AA FA's are clueless in customer comfort. No overhead or underseat storage seats D & H rows 1&2. Contour of ceiling different, no bin doors, seems to be overhead crew rest space. Avoid this seat when flying in business if at all possible. I typically don't mind sitting next to the flight attendant stations or the bathrooms, but 1L is extremely noisy. I had in earplugs, and I could still hear every word the flight attendants said...and they NEVER stopped talking all night long! The only seat that may be worse is 1H--in addition to noise, they put baskets of fruit and chips on the ledge right in front of 1H and 1D. Also in 1H, you can't cross the galley to use the restroom while they are serving food or drinks so you have to go to the back bathrooms by premium economy. PVG-ORD flight. Uneven internet service and inability to use my paid for GoGo Internet plan. Sign in takes your per flight $$ but may not hook on to internet! FAs indicated poor internet service is a common complaint. Seat moved when adjacent passenger moved--tough for light sleeper. Also, FAs control the window shading so you are often unable to look out when you wish--tough when you purposefully purchase a window seat expecting a view! Excellent rear facing seat though no overhead storage due to pilots rest compartment being above these seats. The divider between this and 1H can be raised (if not already) by pressing down on the divider to release it. Chosen as it isn't attached to any other seat. For such a gorgeous, gleaming interior, it's a pretty miserable seat here in Economy. No view outside because you're over the massive wing. I felt completely trapped for an 11+ hour flight from Tokyo to Chicago with the person on the aisle sleeping almost the entire flight. Very little legroom and claustrophobic lack of space, especially when the person ahead of you reclines. No overhead bin space fo middle seats rows 1 and 2 on 787. Flew the 787-8 from Chicago to London and was in Main Cabin Extra seat 9A. The window alignment meant the wall pushed in right where my shoulder was, so I had even less shoulder space than the already tight 787 economy seats. Avoid 9A and 9L if you have broad shoulders, or don't want to sit with crossed arms the entire flight. This is generally a good seat. It faces backward, but I did not even notice after takeoff. I agree that it is a little narrow, but should be ok for a normal sized person. There is a divider wall between this seat and the one next to it which goes up and down, so you can choose privacy by keeping it up if a stranger is next to you or you can lower it to speak with a travel companion. The television programming was very good. American's food service on this flight was pretty mediocre -- who offers fatty short ribs instead of a beef tenderloin, which is what they did on this flight. The FAs were generally ok.
My family and I flew this plane from DUB to ORD on AA209. I was pleasantly surprised with the 788. I have read many negative comments on this bird but I found the best coach seat I have ever flown. At the rear, row 29 and possibly row 30 too. I sat with my wife in row 29 and we both loved it. I sat in 29L, which is about 16 inches from the window. This leaves plenty of room to place your carry on bag. Or you can sit on the armrest and actually look out the window. You can put your legs under your seat or under the seat of the row ahead that lines up to the window. You can cross your legs, tuck a leg under your thigh, heck you can almost stand up in this seat. You do not have people lining up for the bathroom because there are no bathrooms in the rear and you dont hear the toilets. We paid $80 each for these seats and I would pay it again. You should pre order a special meal because you might not get a choice by the time the crew comes to you. We did pre order. The entertainment options are great and kept my teens happy on the 7.5 hour flight. They were seated in the row ahead of us and had no complaints either. Plane noise was about 10 to 15db quieter then the 767 we travelled to Ireland on. There was little comparison to the 767 that we flew on the week before. The 767 seats were painful. I love the 767 but it is getting on in age. I did feel better on arrival flying the 787. Actually got home, did some stuff around the house and went shopping. I will say the windows are odd. Flying during daytime and having a completely dark cabin is weird. The crew dimmed the automatic windows after lunch and I am not sure how the crew poured drinks during mid flight service! I could see out the window but it might as well have been another planet! I do like to see where we are flying but you cant on this plane. Thumbs up to Boeing on the 787. 5A & 5L only have 1 window. The seats in row 19 do not have a window, save for a small one close to the door. Also, an unpleasant air-freshener odor sometimes emanated from the nearby toilet rooms during two trans-Atlantic flights. This aircraft is a great aircraft to fly but the AA business class seats in the 787-800 are of a poor design. In talking to a flight attendant it appears that AA have acknowledged this and are already planning an upgrade but for the foreseeable future this poorly executed design will remain. This particular seat is by a lavatory and that can be annoying - particularly as I watched 3 people come from coach to use it without a word from the FA.....really poor considering the money difference between the 2 cabins. IFE is good, the FA's have an annoying habit of playing with the auto dimming windows - much prefer the 777 whereby once you shut it it's shut for good and not subject to FA's deciding it's OK to have the light stream back in an hour before landing. It's not the best seat but better than BA's awful seats whereby you sit looking at a stranger from 6"
This seat have extra space leftward. And I can come from the seat convenient because there is a hole behind the seat and to the left, this hole is covered by curtains and lead to the rear corridor. I can recommend this seat having sat in it to and from Beijing. This seat is comfortably distant from the galleys and lavatories, and does NOT abut another seat, so the bouncing from neighbors that is so often a complaint in other J seats on this plane is not a factor. Quite comfortable, oodles of storage (a whole overhead bin for just this one seat, pockets everywhere, and a good-sized chest between the seat and the outer bulkhead). Food could be better, but it's at least as good as any other US carrier's fare. Proximity of the lavatory potentially bothersome in the aisle seat, but I had both seats to myself, so no issues. There is at least an extra hand width of legroom compared to other coach seats, and the seats recline without having to bother anyone behind you. Have to pay to reserve this seat in advance, though, so may be worth the extra $ to just go for main cabin extra. Flew LAX-AKL in these bulkhead seats. The legroom was good but as others have stated, the seats are narrow due to the trays and screens being between the seats. The screens made it awkward to get up and out of the row. The middle seat I found to be uncomfortable; I'm fairly thin and I still had to keep my shoulders and arms folded up in front to not touch the pax on either side. My husband and i really enjoyed this rear facing configuration of LAX to Auckland flight as the angle allowed for better communication than most lie flat pod configurations. Caution though, its only the rear facing that have this benefit, forward facing has too much "stuff" between seats to enable easy communication. We also liked being in the smaller Business class section of the plane. Agree with some other reviewers that I felt some movement by the connected 6D seat occupant, but only an issue if you have someone whomis restless (as I did on return flight only). Business class 787-900 DFW-MAD in Mar17. Okay seat, plenty of small storage (not that useful), tv is unmoveable and dinner try cannot be stowed, just stored under tv results in a bit cramped of a bed. Bed is uncomfortable - seems to have a bump in shoulder area - haven't noticed this on any other configuration of 777/767 or other carrier 747 business or first class lie flats. I didn't love the hard product - would prefer the business on the AA 777 or 767. This seat was awful, as it is where the fusilage narrows at the rear of the aircraft. The seats themselves are narrower than the row ahead, and the armrest is over, rather than next to the window seat, reducing it by another 1-1/2 inches. This was narrower than any of the commuter flights I've been on. The 12 hour, completely full flight was from Auckland to LAX. My left thigh is bruised, and my seatmates were as uncomfortable as I was. The row behind has only 2 seats, and it appears that the row behind them was removed. Also-- my seat was changed to this from the seat in my husband's row that I had previously booked. Perfect, after flighting for 11 hour on Iberia which was also excellent I was glad to have great service friendly crew super service. Will never use british airlines when traveling overseas again. They need to go back to be retrained. No all but several crew members. But i will now only fly american no more cheap flights,too many issues with delays etc. Avoid!! Rear facing is just wrong. What were they thinking? 6L is a rear facing window seat in the smaller portion of the first class cabin. Contrary to the comments listed, I did not find any issue with noise from the lavatory. The rear facing seat are close to the windows compared to the forward facing seats due to the angle of the seats. The First class seats offers great privacy and even includes a Do Not Disturb signal to let the FA know not to wake you for meals. Because this was a shorter flight (DFW-LAX) I didn't lie flat and cannot comment on sleeping comfort / width of the seat in the tie flat position. 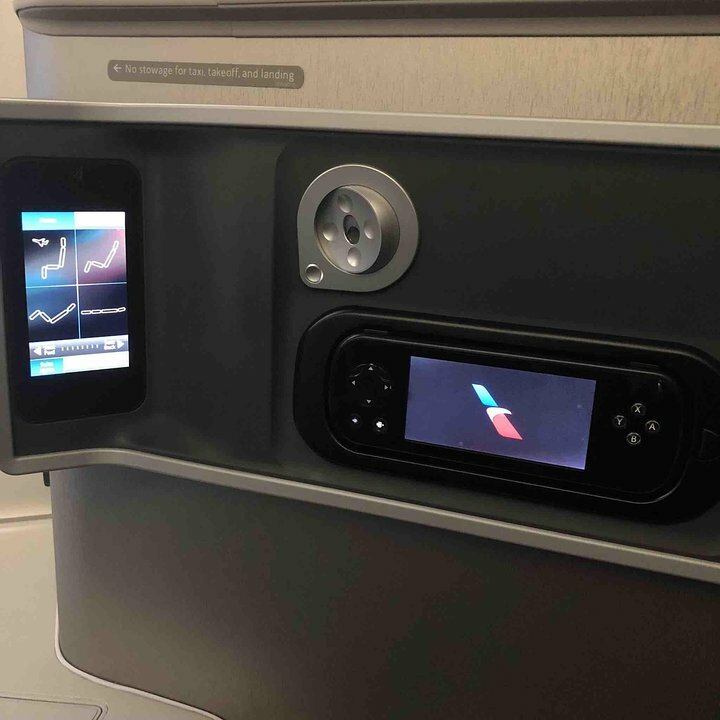 The seat controls are on a small iPhone size touch screen on the suite wall, the removable remote has a second screen which can display the moving map while watch a movie on the large screen. Plenty of power outlets and USB ports as well. Everything is excellent about this plane except the seat design for sleeping. I am 6'2" and don't fit when laying flat as my feet are jammed against the bottom with my head against the top. I will be avoiding this plane on all long haul flights where sleep is part of the plan. Though i got a little bit extra leg room. Every seat on this plane is so narrow, it is impossible not to annoy your neighbor. i am 6'1'' tall and this flight was a nightmare. Just too narrow.. These are preferred seats on the 788 which have a £50 or equivalent charge, slightly unfair as it is likely you will not get a meal choice as you will be the last person on the flight to be asked. After 4 roundtrip flights from DFW-PVG-DFW in Premium Economy, I finally received an upgrade as an Executive Platinum member to seat 2D. Being an experienced frequent flyer of the 777 and 767, the expectations for the 787 were higher in Business Class, as the 787 is a superior aircraft in its air quality, lighting and lower engine noise. I was mistaken in my expectations. Seat 2D was facing backwards, which was OK with me. The menu and other services were at American Airlines typical minimal standards for Business Class services. The big problem is in the structural integrity of the seat units. If you move in your 2D seat, the movement is felt in the surrounded seats in a robust manner. Whoever was the design/engineer for this seating and its configuration should give their money back to American Airlines. AA... you have been screwed! Get a good design firm to properly redesign the 787 layout in Business and Economy classes. AA#127 from DFW-PVG is on the great 787 aircraft. The decision from American Airlines to use a 3-3-3 configuration is dumbfounding. I know people in leadership positions at AA and will let them know that they screwed up with this decision. I sat in 19C, an exit row as an Executive Platinum and it was one of the worst flying experiences I have had. As an Executive Platinum/Emerald member, you get small perks that can make an uncomfortable experience tolerable... you get nothing on American Airlines as an International travel... not even an acknowledgement from the Purser. I can live with this and is of no consequence of the terrible flight experience that was to come. The person who sat in 19B, the middle seat, was a nice enough man... but as he let me know, he played NCAA Division 1 Football as a Defensive Lineman. 6'-3" and 280 lbs... and in shape. His body was so wide, his shoulders were halfway into my seat. So although not overweight, his physique had half his body into my seat space. The local flight attendant was very observant and was apologetic throughout the flight. I missed the Business Class upgrade by one person and I am now thinking that I will now fly another airline rather than subject myself to 1. 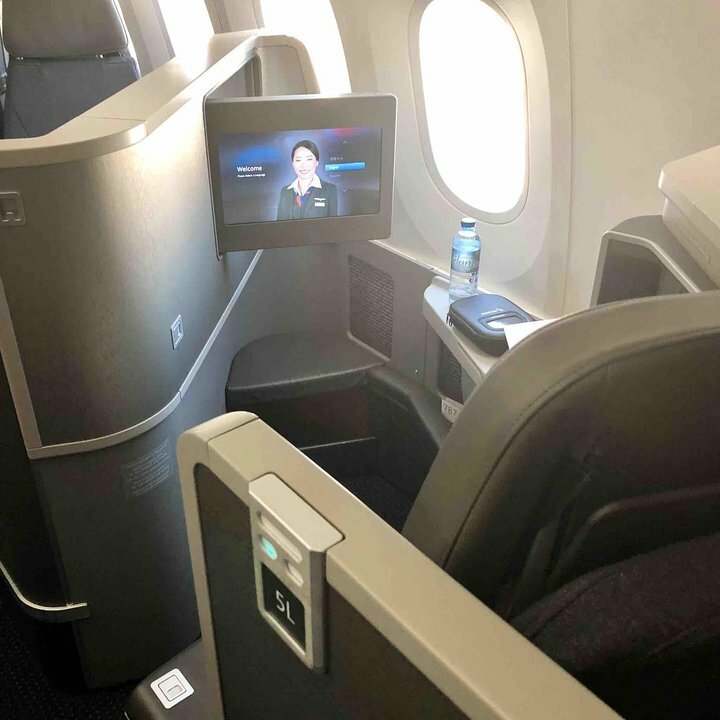 Not getting upgrades on AA due to the new configuration of Business Class 2. Being in premium economy and sitting in inferior seats that makes long haul flights on American Airlines on the 787 inhumane. 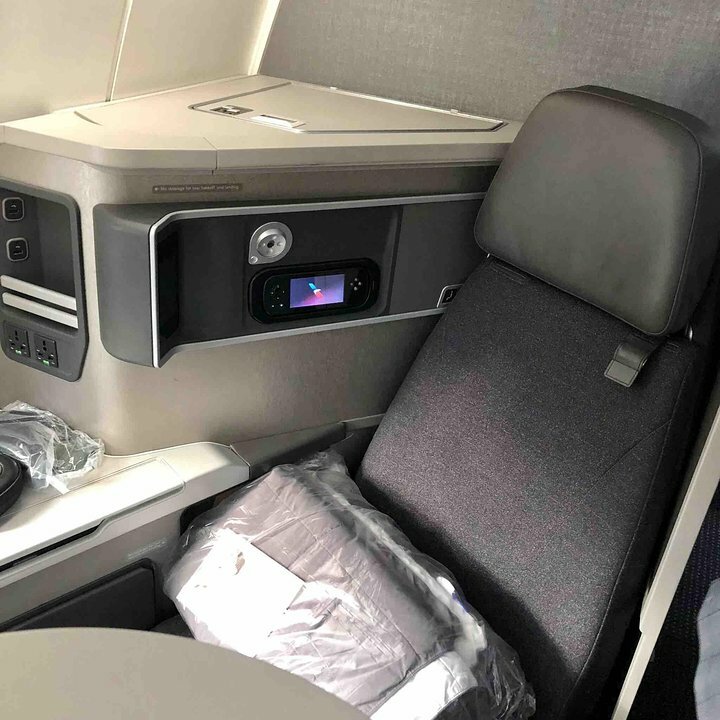 My third trip in 30 days on American Airlines to/from Shanghai to/from Dallas on the new 787 did not improve the experience by switching seats from the last trip. I sat in 8D, which is a bulkhead premium economy seat. For the second trip in a row, I was the last Executive Platinum on the Systemwide Upgrade list that did not get the upgrade, thus yet another reason of my loathing of the new 787 Business Class layout. Being in the 3-3-3 configuration, the middle seat was given away at the last minute to a very nice gentleman who was a bit large. We chatted and acknowledged the narrow seating... which made the awkward 13 hour journey to DFW from PVG a bit more tolerable. As was my experience in seat 19C on my journey a week earlier on the same aircraft, if the 3-3-3 configuration is full, expect and prepare for a horrible experience. I can only hope that American Airlines reconsiders its layout of the 787, as it is a very nice aircraft with a terrible layout. The seat seemed very narrow and no privacy at all. Did not like flying backwards. The flight from DFW to Lax was absolutely nothing special. Seat was very confortable for an 9 hour flight (Dallas to Santiago de Chile) recline was great and the IFE and space between seats was awesome. Legroom was good for a tall guy (6'1) the only bad thing was that the carts bumped you at every time. While the seat itself is not bad and it certainly beats what United currently offers on their 787, it certainly is not anything to write home about. The seat on AA's 77W is much more spacious and confortable. One of the worst part about this seat is that it is directly connected to the seat behind you, so every time they move, it moves your seat as well, it gets very annoying. Plus this being a backwards seat it had very little shoulder space. The plane itself is amazing though, very quite. row 5 is not even close to the Lav and the aft galley in Business is not used for food prep so not much noise. Row 5 seats are very good. Simply put the most uncomfortable plane in the air. The aisle is narrow and the seat is way too narrow. My shoulders stuck out into the aisle and were bumped by carts on those rare trips down the aisle by flight attendants. The seat was also hard and badly designed, leaving little proper support for anyone 6 feet in height. All of the "advantages" of the 787 are outweighed by the (foolish) decision to shoe-horn in an extra seat per aisle. Go to 8 across and you can an inch and a half to each seat and 2.5 inches to each aisle. The difference would be significant and meaningful. 19L (and 19A) is great since you get a lot more legroom but don't have to pay extra for it like the aisle and center in the same row. The exit door barely limits the space, and you may be able to prop one leg on the exit door (but flight crew may fuss at you). The tray table is very wobbly so have to be careful when eating. Can't see out the window well unless seat is reclined. This is a rear facing seat and the good thing about this is that you're not staring at someone the whole flight, so it is good for privacy. You do however feel the person in 2-D moving. Overall it is not bad. This was my first experience with a pod seat and with a 787. The seat was a disappointment, and I would have regretted booking on a 787 for a longer flight. As it was, 4 hours from ORD to LAX was long enough. The seat is very firm (almost hard), has no lumbar support, and has no storage except in the overhead. The entertainment system is really wonderful, though. The electric dimming windows could be nice, except the cabin crew can override passenger wishes. Shortly after take-off, when I was looking forward to enjoying a westbound sunset flight, the crew blacked out the windows, and I could not override the blackout. I do like the privacy of the pods, but AA's choice of seat is poor, in my humble opinion. I have found the 777 to be a much more comfortable plane for business class travel. Seat 5L is a business class seat close to the galley and a bathroom. Despite this, the good news is the seat faces away from them and towards the wall/window of the plane, very private. I watched a movie, then went to sleep with my noise cancellling headset and eyemask and was not bothered at all. I was very comfortable in the flat bed, the entertainment system was good and the USB ports for charging my phone were very convenient. Good seat. Travelled AKL-LAX-AKL in economy. On the positive, cabin crew really good, friendly and fast meal service. Even kindly gave my wife a bottle of bubbles for her birthday! On the down side, seats are really the most uncomfortable I've experienced in longhaul. I'm 180cm/5ft 11in and my knees were hitting the seat in front. The seat tilts and lifts underneath your legs and its really impossible to stretch out like a normal seat would allow. When the person in from reclines it is right in your face and forces you to have to recline. IMO the seats entirely ruin the positives of the Dreamliner. Would not fly this one again - too much suffering. DFW-ORD was extremely comfortable in this seat. Only slightly felt the shaking many have described maybe once or twice. I would be very comfortable in this seat for a long flight. Unfortunately this is a tough configuration to be able to talk to a companion while seated. Last two Rows (29, 30) for A and L (Window seats), have enough space between the seat and window to squeeze out behind you and into the aisle without anyone having to get out of their seat. Better than Main Cabin Extra. I flew from LAX to Tokyo Haneda on 27 July in 3A. It was not as comfortable in the fully flat position as I expected. My crew type shoulder tote would not fit in the small storage area. In coach it would fit under the seat. If you want to see out of the window, get the rear facing seat. My 8 year old grandson was in 4A (rear facing) and enjoyed his location. Absolutely the worst long haul seat (LAX to Auckland) I have ever endured. As I am only 5 ft tall I never have a problem with too little leg room however these seats are so close together that if you drop something (like I did with my glasses) it is impossible to bend down to retrieve it. Also when the person in front of you tilts their seat back your movie screen does not tilt so you only have the option of tilting your seat back or crouching down to see the movie. For me tilting my seat back meant my feet didn't touch the floor which is extremely uncomfortable. We will never fly American Airlines again if this is the plane they are using for this 12.5 hr service. Only flew between LAX-ORD, but 3A was a very comfortable seat, fit me well at 6'7", but I would agree with the other comments that when the person in the seat behind or in front of you moves or bangs something, you feel it in your seat. Did not have this problem with FC on the 777 because of the way the seat is attached and completely separate from the surrounding ones - the ones on the 787 are connects and a little close. They are the more typical individual business seats. Service and food was surprisingly good - better than average FC or Biz on AA between destinations. Recently flew from ORD to PEK in Business Class, seat 4D. For this 13 hour flight, I would never fly coach on AA's 787 config. I've done it on their 777-200, which was tollerable, as long as you have a decent seat. The good: 1. Comfortable seat, for sitting and reclining. 2. Large video monitor, with great selection of video content. 3. Good food, more than you can eat. 4. Bose headphones The bad: 1. Coffin-like space in these seat "pods." I'm 6'2" and when lying flat, I had to cross my legs, as there was not enough room for my feet to lie side by side. 2. As others have commented, my seat was connected to the one behind me, and every time that person moved, so did I. Annoying when you are trying to sleep. Overall - I can't really complain when sitting in Business Class. However, AA seems to be overthinking their seat design too much with these pods. Plane is simply beautiful. Quiet, lower air pressure, the bend of the wings, huge windows. Unfortunately, AA has created an absolutely HORRIBLE layout and seat design. Per other comments - coffin-like, hard to reach controls, poor storage, rocking from seat mates. Soemthing to note - AA appears to cancel its PEK flights from ORD and DFW pretty regularly for yield management and reroute pax and crew to the alternate flight. Deadheading crew seem to grab the best Biz Class seats first - all forward facing, away from galleys, which is what I now book when crew hasn't already taken them. Facing backwards was not a problem. The problem was the lack of storage around the seat and the privacy divider was stuck in the up position and we wanted it down. The stewardess claimed it was an FAA rule/safety issue and only certain ones could move. She said this with a straight face like we were to believe her. I hope never to have to fly this type of plane again. The additional legroom in the 'extra seats is really nice, and the seat width is sufficient even for someone of my girth to roll around, but.... it seems that courtesy has become an "optional" amongst AA flight attendants. my complaints about this plane/seat are: 1) the crew controls the windows and keeps them as dark as they can be, effectively removing any possibility of seeing the landscape below. On a PEK-ORD flight near the summer solstice the route crosses the polar circle andI would have liked to see the Arctic below. alas, the FAs did not allow it (even after an explicit request). 2) the video screen is fixed onto the back of the seat in front of you. If that passenger reclines his seat, you too must recline, else the screen loses all brightness (on the plus side, as the back goes down, the seat moves forward: very comfortable) 3) whoever decided to install touch-screen on the back of a seat is criminally insane. there is no way to rest when the teen-ager behind you plays video games and hits her screen to move the characters. This arrangement is a very bad design IMHO. this seat has plenty of legroom, since there is the exit 'alley' in front of it. you pay for that with a narrower-the-the-rest seat, due to the tray table in the armrest. there is no under-the-seat-in-front-of-you storage and no pocket to keep your small stuff. worse of it all, the crew kept the windows obscured for the entire ORD-PEK flight. it felt like a flying coffin. I liked to look out, and this felt like a flying coffin. ORD-MAN June 24. Horrible, horrible, horrible seats. What a shame, such a nice aircraft but the seats ruined the entire flight. My husband, son and myself sat in row 10 of MCE...seats were too high, I'm 5'2 and my feet almost dangled and the seat itself lifts once one reclines. We did not rest at all and even my 9 yr old son complained. The extra legroom is great but not worth it on this plane as the seats are so tight and killer on your back. When we boarded, one FA was at the door looking down at her phone, yes, that's right, scrolling away and didn't even look up. Very bad customer service from all of the FAs on this flight in economy. Re-train your flight attendants and do something about the seats on this aircraft. Aisle angled in front of seat, so you cannot stretch out your legs and sleep. Flight attendants going between cabins will run into your feet as they come through curtain. The rear-facing window seats are great. 4A puts you close to two windows and offers a great view of the left engine and the beautiful wing sweeping up into the sky. Traveled from PEK-DFW on the 787 and I have to say it was disappointing. I would highly recommend the rear facing so that you are closest to the outside, to prevent aisle traffic hitting you with bags, etc. Also the proximity to the large windows is nice for those who actually look outside during flights. The layout and seat constant movement from my seat track mate in 1L was annoying. For all the hype on ergonomics, the seat layout was highly unfriendly. First, the contortion act to get the entertainment controller behind your shoulder and high is ridiculous. Second, the side table on the rear facing seats is too small to place large electronics (ie laptop). So in order to use it, you have to have the tray table out. The location of the window dimming controls was too low and in an ackward place, so you had to come at it from the top to control it. As someone who does not sleep, I was also VERY annoyed that flight attendants can lock you out of your window controls. Since I like to get back on a rhythm, sunlight is required. Their insistence on locking out the controls to near darkness was frustrating. I had 24L from LAX-GRU. I was shocked at the size of this "space," the seat was both the narrowest and the shortest pitch of any long haul I've ever been on. Although the entertainment system was fantastic, I agree with other commenters in that once the person in front of you reclines their seat, the screen is then out of direct view, and due to a filter that optimises direct, straight-on viewing, your picture then becomes fuzzy. The one saving grace of this seat config is that when one reclines the seat, the bottom also tilts, forming kind of a bucket seat. TIGHT for sure, but ended up being somewhat less uncomfortable than I feared. One extremely annoying thing about this flight/aircraft is the lighting/window mandatory configuration. Much has been ballyhooed about the electronically dimmed windows, but one aspect that isn't often discussed is that they can be centrally controlled by the crew. They kept this aircraft pitch black with the windows mandatory dimmed WELL into the next day after morning. An attempt, in my opinion, to keep everyone "asleep" so as not to have to provide any kind of services. They finally undimmed the windows well after noon local time. It had been light for hours. Definitely a squeeze width-ways if all 3 seats are occupied which sadly they were on my recent LHR-ORD flight. However, the seat itself was actually very comfortable and the recline was very pleasant. IFE was good but the service was grumpy and the food was terrible - frozen salad due to someone turning the fridge up too high. But the aircraft is good, quiet and smooth, business class seats looked comfortable although rather narrow. Don't like the new business class setup and seats on AA. Though older, the older version of business class 2-3-2 all facing forward was much more comfortable. As mentioned Seat 5H is connected to Seat 4H. Same with other seats in the business class cabin. So when you are asleep, and the other passenger gets up, your seat teeter totters back and forth. In 5H there was constant noise and chatter from the galley. Also, in the seat facing the bulkhead wall in your little coffin made me feel pretty claustraphobic. Gonna try 3A on my next flight and see how that goes but never row 5 again. Last week we flew from DFW to Santiago Chile in 29L and 29J. We got to spend 15 hours in these seats since there was a diversion to Concepcion. These AA Preferred Seats are not worth the money. You are just paying for the 2 seat layout. If you are going to pay more, get the AA Main Cabin Extra seats. On the return flight to DFW on AA940, we paid extra for 11E and 11H Main Cabin Extra Seats. The 5 inches of extra pitch made for a much better return flight from Chile. Also, these seats could use more lower back support. After just a few hours, I could feel some discomfort in the lower back. As others have said, the 787-8 is a great aircraft that needs better seats. The proximity to the galley was very bothersome. Even though the drape was drawn it opened very frequently disrupting my sleep. I felt claustrophobic and had to look at the person across the isle the entire 13 hour flight. I am 6 foot and could not fully lay flat in my seat making it difficult to sleep. I did have 2 windows providing good views. Good entertainment, power outlets, quiet. 5L does have an armrest that lowers so it is not so claustrophic and 5L does not face another passenger. 5L is a great forward facing seat and the arm rest lowers giving a feeling of more space. Quiet and did not face anyone across the isle. Close to galley for snacks and bathroom. This seat does just have one window and you have to undo the seatbelt and lean forward to look out. Still very private. 1DH and 2DH are middle section business class seats. There is no overhead storage for these seats as the pilot bunks are located directly above these seats. As a result, you have to use the overhead bins for the window seats. 10H is a good seat given the added seat pitch and the convenient location of the AC power outlets. I flew LAX to PVG - a very long flight - and was able to get a lot of work done on my laptop, enjoyed a couple of movies and even slept some. Never again; I had this exit row aisle seat for a DFW-PVG flight and it was a miserable experience. Yes, passengers do tend to gather in this exit area and the proximity to the galley is very bothersome, since the galley light was on for the entire 15-hour flight and the area in front of my seat became a SRO cafe. The physical seat itself was not uncomfortable, despite the immovable armrest... the ambiance left much to be desired. The window wasn't THAT misaligned, just a little different from the other seats. It was exactly aligned with my head, so I found it great for looking outside while resting my head. I purposely booked the 787 flight when they were going from Chicago to Dallas. I had Main Cabin Extra and the extra leg room was nice and the entertainment system was awesome. It was nice having a USB port to charge my device. It really helps get your mind off the stress of travel. My biggest gripe was lineman size guy I was sitting next to, why I normally don't have an issue with the width of the seats, his large size made me feel like a sardine. I sat next to anyone else, it would have been fine. The 787's unique higher pressure and higher humidity added to the comfort level. We just flew Narita to Chicago in regular economy. The recline on the seats were great, slept 9 hours of the flight pretty comfortably. That being said the seats are pretty narrow. There were 3 of us traveling, (myself my 12 year old granddaughter & husband) so we put the armrest up in between us which made that better. I would not want to travel solo on this plane, you would be squished up against a stranger. We flew the Dreamliner to Narita with JAL and overall I think JAL had a much better layout, wider seats & better cabin service. We do this trip often, so I think our next trip to Asia may be all the way with JAL. Seats 1A, 1D, 1H and 1L do not have overhead bin storage so if you show up late you are having to share with Rows 2 and on. Probably worth noting. This is an awesome airplane, with a HORRIBLE seat layout. The 787 was meant to have 8 abreast and not 9. The seat width is horrible for Main-Cabin extra, and on certain rows since the seat is so close to the plane wall, the division between the windows takes away an extra .5 inch from your already ultra small area. This seat is NOT meant for long haul, specially NOT on a 15+ hour flight to Shanghai. Couldn't get any sleep as the flight attendants chatted non-stop for the entire flight from Chicago to Tokyo. The seat itself is good but the proximity to the chatterboxes made for a miserable flight. The 787 is a major step up from the old 777 that used to be on this flight. But I agree that the seats are certainly no wider! So one commenter here said to get the window seats for row 10, as row 8 by the bulkhead was supposedly too short for anyone over 5'10". Totally wrong. While not quite the total stretch out on the 777 bulkhead, they were fine for the 16-hour flight to Shanghai. And far easier to get around the plane than nonbulkhead seats. Seats 8A and 8L have the wide window as well. They are cool the way they dim with quite pleasing colors. Was fine for me at average height and weight, but suspect that anyone taller or just larger might find it a bit snug. Love the larger windows and lower pressurization, this seat really only has one window but that is ok. I flew on this aircraft from DFW to LAX. I sat in 17J and found it to be an excellent seat because I was able to recline without bothering the individual behind me. The lavatory was not bothersome at all! Worst seat in the history of business class. Only one window, narrow footwell, generally claustraphobic. Not to mention noisy with the crew gathering close-by. Great airplane but not this particular seat. Look forward to trying others in the same cabin. Flight attendent told me rear facing in the middle are the best, according to pax comments she's heard. On business seats in the middle rows, the seat dividers do not lower on forward facing seats. Even when the divider says to lower, push, nothing happens. Even the FA's were very confused at way this is the case. On AA new 787, middle row seats dividers don't decline on forward facing seats. LAX-DFW on the 787- The seat was spacious, entertainment system, same as 777-300ER, electronic controls to adjust seat/leg rest, spacious ( and easy to use ) tray table, and a little area below the ottoman for storing shoes etc.... As mentioned in other reviews, the forward facing hand held devices for the entertainment is positioned backwards,but not a challenge. Cabin pressure is definitely appealing- no sinus challenges during or after the flight. The dinner service was great for a 2 1/4 hours flight. Overhead bins slowly open versus older planes that quickly, sort of fall down. Bathrooms are ahead of the older aircraft/more modern technology. I would certainly choose the Business Class cabin on a long-haul flight. Galley is close to row 5, and unless you're wearing headphones, FA's do tend to assemble, there and talk loudly. Awful. The seats are too narrow, there is very little room when the person in front reclines, and I was getting bumped the whole flight. Absolutely miserable. 1) There is no overhead storage area above seats 1D, 1H, 2D, & 2H. 2) For all seats in business, you can't have a personal belonging bag in your "pod," must be stowed for takeoff and landing (which is hard when you don't have the storage above you). 3) They do not have Gogo internet on this airplane like other American Airline airplanes. It is provided thru T-Mobile and will not tie into your Gogo subscription, you have to pay for it separately. Seat 2 A is connected to Seat 1 A. Same with other seats in the business class cabin. So when you are asleep, and the other passenger gets up, your seat teeter totters back and forth. These seats are made by Zodiac and are junk. The seats are way too narrow, and there is too much plastic that does not fit very well - referring to the trim around the seats. You cannot even lie down with your hands behind your head - I'm 5'8" 150lbs, and the seats were the narrowest things I have ever sat in. People that spend their own money on flying in Business Class on AA on the 787 are in for a poor experience. The airline has made a terrible mistake by putting these seats into their flagship jet. DFW to ORD during the day. 787 is a fabulous airplane...AA's configuration not so much. Very tight F/B class seat, only one window, the second is blocked by a huge console with seat/entertainment controls. Low ceiling (hey AA, there is a high ceiling option...see LAN) dark interior colors, just not an attractive environment. Like AA's re-done 763s, to save space they've crammed the premium cabin with seats with minimal seat pitch and in the case of the 787, rear facing seats. My seat was 13-H LAX to DFW. For a medium build adult American male the seats and isles are entirely to narrow. This airplane should not be allowed outside of Asia. I will never fly on it again in unless I can get a seat in Business Class. Excellent air craft...enjoy the plane and quite. Seat has great control and if you have choice go on the 787. The seat pitch is exactly what you would expect from 31", which is tight. Along with a narrow seat, one feels quite confined, more so than in many other long-haul economy class seats that I have experienced in the past. The tight seat pitch is somewhat ameliorated by the higher-than-usual seat cushion, which by causing the legs to drop down at a steeper angle to the floor actually requires less seat pitch to have the same sense of space. This is however a two-edged sword, as shorter passengers, such as my 5'2" wife who was seated in 21H, may not even be able to touch the floor with their feet, especially when reclining the seatback (this causes the cushion to rise). The AV system seems to be in need of debugging, as it froze up on my wife. When this happens, call a flight attendant, who should be able to reboot the system just for you, as was the case with my wife. This Main Cabin Extra seat had the promised legroom, but the seat itself was quite narrow, due undoubtedly to the 3-3-3 configuration. It was indeed a narrower seat than in the main cabin of the MD-80 that I had flown on before boarding the 787 for the ORD-NRT segment. The seat cushion is set high, higher than usual, likely in order to give the feeling of having more legroom than the seat pitch indicates (legs would angle more acutely versus the floor). That effect is real, but this is often tiring for shorter passengers whose legs end up dangling off the floor, which happened to my 5'2" wife seated in 10H. The seat reclining mechanism raises the cushion yet higher as the seatback falls. For shorter passengers, having an improvised foot rest, such as a bag, should make a longer flight much more comfortable. It would have become an intolerable situation for my little wife had it not been for a daypack that she had brought onboard to place under the seat in front and used throughout the flight as a foot rest. I flew in an AA 787 from Dallas to Buenos Aires, return. The seats are very narrow, as is the aisle. Passengers seated in aisle seats are repeatedly bumped by other passengers, crew and the service cart. Leg room does not exist. When somebody reclines in front of you it is very difficult to read, eat, or view the entertainment system. The plane has lots of bells and whistles, but the thought that came to my mind was that a sardine doesn't care what kind of can he's in. If I have a choice I will avoid the 787 in economy. Not enough space. I flew on DFW-LHR route in Main Cabin Extra and my initial excitement for the nice seats very soon faded out. Those nice seats are terribly narrow! 3-3-3 configuration in economy is way too much. And I am only 5feet 7 inches tall. On the return flight I flew on a British Airways 3-3-3 configured B777 and it was so much better! This seat was cramped and quite awful for a flight of this length. AA has taken a beautiful plane and turned into a torture chamber with very narrow aisles and very small uncomfortable seats. The entertainment display doesnt tilt so when the seat in frint reclines it is hard to view. 9L is an MCE seat with extra legroom. Flew a night flight between DFW and LHR, one of the best flying I've done in economy between the US and Europe. Main cabin extra seat, window. Very comfortable seat, good leg room, but felt very narrow (row 11). The frame in between windows was pushing my shoulder into the middle seat. Luckily the pax there was small. Choose row 10 or 13 instead, so the window is next to your shoulder. Other than that. Great aircraft. Can feel the difference in pressure and humidity after a 10 hr flight (EZE-DFW). Great entertainment system. Very quiet (I was next to the engine). The entertainment system wasn't working, so they rebooted it. Our 787 then broke (related to the restart?) and AA flight was cancelled, leaving us stuck in Buenos Aires for 24 hours. The next day's flight had a similar issue with the entertainment system. Business class food was good. Bose headphones helped with the noise a lot. Loved the entire trip. Did not know my plane was going to be the dreamliner so i was very surprised. Luclily had ear phones with me. Movie feature was great. Had a lot more leg room. Had to fly back on regular jet. Boo. I will change my plans for next trip to get this jet. The 1A have just 1 Windows and is near at the galley and the bunker where the pilots sleep so, the crew is every time there talking and is really bother. the 1 D dont have place to keep the luggage so, use the place of the 1A. Flew EZE-DFW in July 2015. I'm 6'3" and a long-time AA Exec Plat. I pay for my own tickets, so mostly in Coach and rely on upgrades. The 787 is far worse than the 777 for upgrades: nearly 50% fewer combined Business and First seats. Despite being No.1 on the list for a month I did not clear, for the first time in about 2 years ... a bad sign, since the 787 will be widely substituted for the 777. So, 9L in MCE it was. Leg room is tolerable, but this is an extremely tight fit width-wise with 9 seats abreast. Body to body for 11 hours... Seat 9L is slightly misaligned to the window, so the window frame further cramps your shoulder space. 9A is the same. Row 8 has restricted legroom for anyone taller than about 5'10' (170cm). So, for those stuck in coach, pick your seat carefully! AA, you need to remove a column of seats in Coach! Bigger windows, 400 movies and slightly quieter cabin is simply trivial if you cannot sit comfortably and your body cramps up and gets sweaty from the body heat of the passenger next to you! Economy is a sardine can. Leg room is terrible and I'm only 5'10". Fortunately it was only a 2hr flight to ORD. Any longer and I would have had a blood clot. If you must sit in economy, I highly recommend an aisle seat so you can stretch your legs at the very least. Overall, very comfortable chair, but as a bed, could use more cushion. Odd layout of forward and rear facing seats made it seem like the person in 7D was staring at me the whole flight (didn't help that he was yakking on his phone the first 2 hours of the flight; curse you, wifi calling!). Excellent power outlets. Very difficult to get in/out with the seat flat. Interesting how people from Main Cabin (right behind this row) actually climbed *through* the closed curtain to get to the business restrooms. 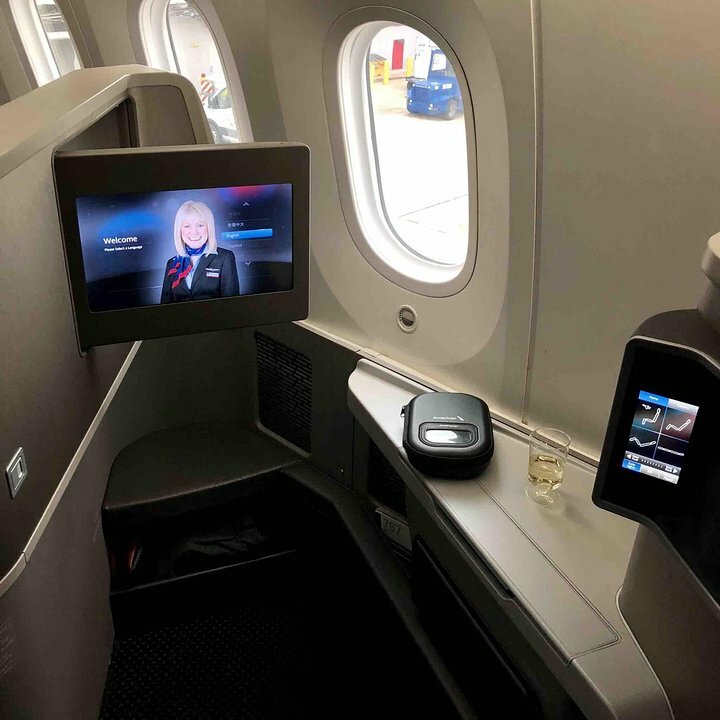 I flew this new aircraft and new Business Class product from DFW to ORD, and I can generally say that I enjoyed the experience. However, as a previous poster has pointed out, I could feel all the movements from the person in front of me (in 1A). I was constantly being jiggled, and it became somewhat annoying on this short flight. I cannot imagine the annoyance level on an overseas flight. I do not know if this is a problem specific to the rear-facing seats, but I would choose a forward facing seat next trip. There is also the issue of looking almost directly at the person in the seat across the aisle, which has the potential for some discomfort for both parties. That said, the direct aisle access, the nice seat and IFE controls, the adequate overhead storage, expansive tray table, and the enhanced environment particular to the 787 make this a desirable business class product. I love the new 787 planes! The economy premuium seats were very roomy and the new entertainment console is fantastic with tons of on-demand music and videos along with wifi for those who must be connected. These are a great improvement over the 777. The lighting scheme is cool along with the new electronically dimmed windows (no more sliding shudder). Just traveled from Buenos Aires to Dallas on this new bird. I was in the "Main Cabin Extra" Section. I have to be honest that even in the Main Cabin Extra seats this new "Dreamliner" setup wasn't exactly a dream. It feels like the main isles of the cabin are narrower and with the new 3-3-3 configuration, anyone on a aisle now really leans into the aisle, thus creating less space. You really are shoulder to shoulder in these seats. 9A has the divider sections between two windows right where your shoulder should go, which makes the space feel even smaller. For some reason, they didn't make the IFE consoles tiltable, so when the guy in front of you leans his seat back, it give quite a strange angle to the screen. The main cabin extra section does give more legroom, but due to the 3-3-3 configuration, even with the extra legroom, you still have to bug seatmates if you want to get up. All in all, not a bad seat (better than regular economy) but has it's drawbacks. I have been lucky to travel on this plane 3 times in Business Class!! It is absolutaly gorgerous also note when sitting faceforward in business there is a shoulder strap you wear for takeoff and landjng! Also there is an adjustable arm rest for the seats facing forward!! It is worth it to sit in these seats!! Wonderful airplane and great addition to AA's fleet. Seat controls on the touchpad are a great feature, as is the ability to control the reading lights from it. The seat diagram on the touchpad screen didn't correspond to the seat position, example 'home' position didn't get the seat back upright, but I assume that's a software glitch. Big downside if you're in the rear facing seat, you can feel all the movement from the passenger in front. Not a big deal on a short flight but could be a big issue on an overnight flight. Sitting backwards was fine for me, but it's an awkward angle because the seat faces directly at the passenger across the isle. Makes it feel like you're staring at them, and vice versa. Other minor issue is not being able to store a small bag under the seat as can be done in the 777 flat bed seats. I chose window seat on this flight to be by one of the huge windows. Very nice view but that is the only good thing to say about this bulkhead seat. They have crammed 9 seats into each row, feels tighter than seating on MD-80's. I can't imagine sitting in a regular coach row all the way to South America. I've flown the AA 787 four times and have the following comments. 1) It's a very quiet cabin. 2) The windows are huge. 3) The wings seems to flex to the heavens. 4) The reverse seating business class seats are pretty cool, though a little narrow. 5) AA should have gone with 8 across in the main cabin. Even the AA 737-800 product seems to have more width in the main cabin. 6) Wouldn't want to ride all the way to Hong Kong sitting in steerage. 9L is a good seat. It is one of the first served when cabin crew does beverage service. The only thing bad is the under seat storage doesn't have dividers between the seats so that could potentially create an argument between people. Luckily, I did not have anyone in the middle seat. The entertainment system is very good, but it takes some time to figure out how the remote works and such. Definitely worth paying for main cabin extra. Legroom was the most I have ever had not sitting in first or business. The windows are slightly misaligned, but very big. First class seat are nice, but a bit tight. The first 2 row of seats in the D and H first class area do not have overhead storage, must share it with the ones in the A & L area. The side seats on the mini first class cabin are rather nice. Curve of plane makes this seat uncomfortable. Seat felt narrow. seat 1A should be labeled 'red.' Noise from the galley is extremely disturbing thtoughout the flight, there is restricted legroom in the lie-flat position (im 6'0" and my feet were squisshed and knees bent), and for seats that are forward facing and connected to a backward facing seat, you feel EVERY jerk and movement of the pax in that other seat. Its very disruptive, and i dont reccomrnd this seat AT ALL. Seats 19BCJK have infinite legroom due to the exit door in front. However, the slide protrudes from the door and restricts legroom in seats 19AL. There is no underseat storage for any seat in row 19. Whatever you do, don't sit in 19A or 19L! They are completely squeezed against the side of the plane and the exit door juts into the legroom area. It is absolutely miserable. Avoid at all costs. Otherwise, it's a gorgeous aircraft. Forward facing window seat but view out window is poor due to angle of seat. Rear facing window seats on this aircraft angled for much better view. Im looking forward to this addition on international routes from DFW, the plane is due to enter service shortly and i want to be clear my comments come from my observations not from time onboard. I'm dissapointed to see AA introduce rear facing BC seating, I've flown in rear facing seats on BA and found them very disorientating. These may work for flight attendenants on takeoff and landing, as a passenger I'm not comfortable spending 8-10 hours facing backwards. Economy has 9 seats across and 31" seat pitch, which is a very crowded seating configuration. This is similar to British Airways 787 configuration and difficult for anyone near 6' tall. This plane is very modern and I was very happy to see that American Airlines has added it to it's fleet!